Redstarts, Gray Kingbirds, Oystercatchers & White-winged Doves OH MY! A few things of interest here on the coast during the past week. 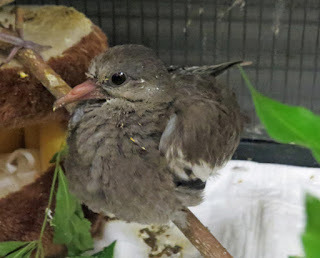 For starters, our local bird rehabilitators came into possession of a large fledgling White-winged Dove right at the beginning of June. It came to them through a vet clinic. When queried, the vet reported that the person who brought in the bird had found it walking around in Daffin Park in mid-town Savannah. Through the years, Steve Wagner has occasionally reported a White-winged Dove visiting his yard in nearby Ardsley Park. Could this be a first breeding record for the state?? Wish we had more info! 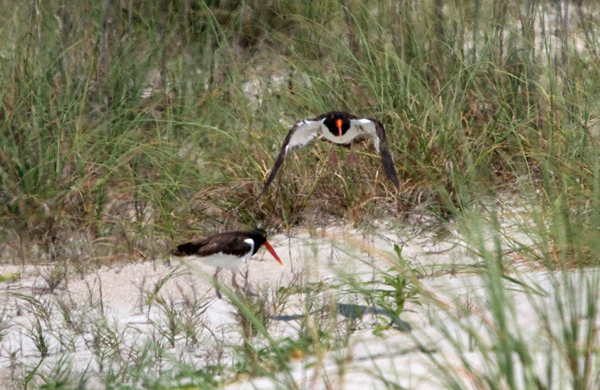 Next, an American Oystercatcher pair returned to nest on the North Beach of Tybee again this year. 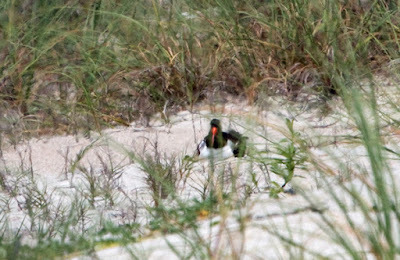 Of their first clutch of 3 eggs, we saw one chick that later disappeared due to a predator, we think. Cat tracks were seen in the area. The pair has re-nested and we are hoping for a better outcome. Public Works and DNR will place some traps but these ferals are quite wily. Ideas anyone?? I happened to catch the birds when they were trading off the incubation duties. "You can take over...I'm getting hungry!" Settling in for the long sit! Third, this morning I heard an unusual call in my yard and found an adult male American Redstart singing and calling loudly, while a Yellow-throated Warbler sang nearby. A very late date for this bird!! It must have known what yard to visit so that its presence could be documented! 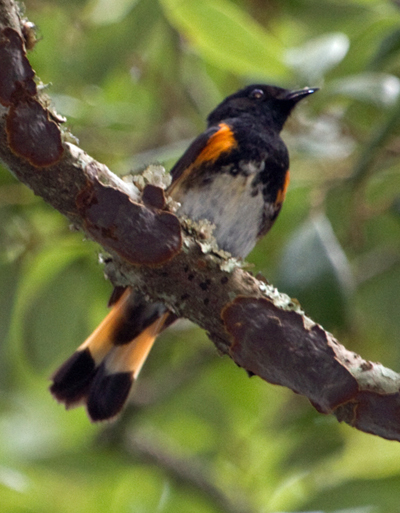 American Redstart male was singing loudly. 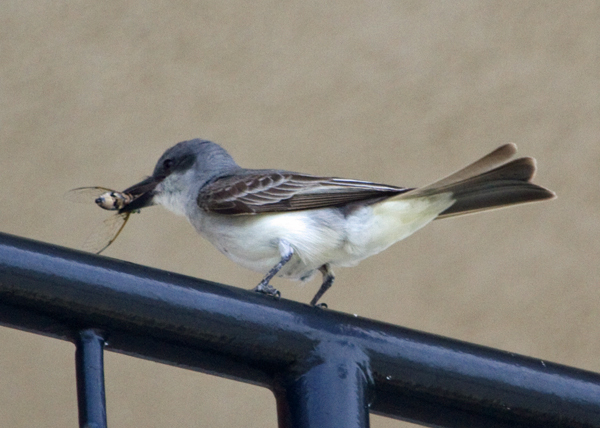 Finally, this afternoon I went over to Hotel Tybee (formerly the Ocean Plaza Resort) looking for the Gray Kingbirds. The new management has signs throughout the parking lot indicating Permit Parking for Guests Only or you can pay $20 to park so it is not as easy to scout there as it used to be. I went down 15th Street, the street by the Breakfast Club, and about 2/3 of the way down found one Gray Kingbird perched on the wire. It was right near a power pole with lots of added electrical hardware. As I watched, it flew off and then flew to a nearby palm tree. When I checked, I found the second Gray Kingbird settled onto the nest. Hooray! 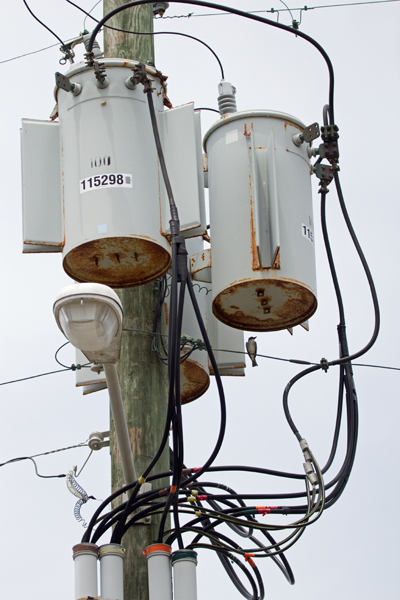 Gray Kingbird in its high tech location. 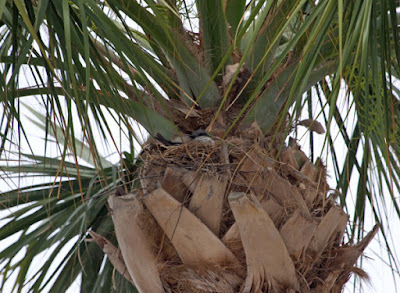 Palm tree where the nest is.